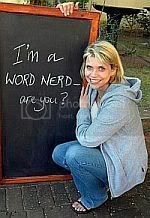 If you are, send us a pic of yourself – alone or with like-minded family and friends – and we’ll post it in our Word Nerds gallery. Include a Word Nerd-appropriate message somewhere in the photo (you don’t need a chalk board – a poster, a sheet of paper, or whatever else you can dream up will do). And don’t forget to tell us your name and and where you live.